Darlings, excuse my language up there in the title, but that is how our year ended. In 2016 I pushed myself to stay awake until midnight, just to see that insignificant year dying. I mean, nothing was really wrong in it, but the energies just weren't on my side. But, maaan, 2017 ended in quite opposite feelings. A new job. A scholarship for both of us to make a book with our talented colleagues. A new home, and most importantly – a beautiful baby boy, who wakes us up every morning with his toothless smile. It really seems that the universe was, or is, on our side, and we got one more great chance when we realised we could organise our calendars so that we could spent the last nine days of the past year in a cabin in Olos, a little resort nearby the town of Muonio, Lapland. The Christmas Eve was cold and bright. As fresh parents, we've already learned to do sport in turns, and it was still twilight when I closed the bindings on my xc-skies in the morning. I made a round around the fell Olostunturi, an ancient mountain, and breathed in the cleanest air of Europe in the middle of fluffy, snow-covered spruces. Most of Finland's forests are full of planted pine trees, and it's like a kind of awakening to be wrapped in an old, natural forest, full of thick trees. Anssi's turn was after me, and he picked his route more wisely: A landscape trail that follows the fell's side and passes the landscape fire place along. Hear us, people in Olos: You should make that trail as your first priority in marketing. It's the most beautiful piece of Finland you see along the trail, and in our family we can never get enough from those smoothly rolling chain of fells and their silence. The temperature was rather cold around Christmas, and we're secretly hoping for a bit warmer days – if you can call -10 celsius warm – to test the Fjellpulken that our son got from Santa at his first Christmas. Fjellpulken is a kind of a sledge with shafts, so you can easily slide also downhills with it. Finally a perfect day came at the last day of 2017, and we placed the basket from the stroller to the sledge and the son in to it. As most of the babies in Finland, he loves sleeping outdoors. In the basket, he had a down sleeping bag and a winter hat and gloves. His sleeping bag is super warm, and most of the times he uses it, he's sweating. Anssi and I had snowshoes and poles, and we could easily move in the middle of the forest on a fresh and deep snow. Fjellpulken moved surprisingly well on snow, and our concern of making it flip to its side turned out to be unnecessary at least on that terrain. Fjellpulken is a good investment for a family who wants to go out with a baby in winter time. Here in Lapland, especially in periferia, the roads are in varying shape, and pushing a stroller isn't always a pleasure. Fjellpulken makes it possible to go to the places with no roads, and that's awesome. 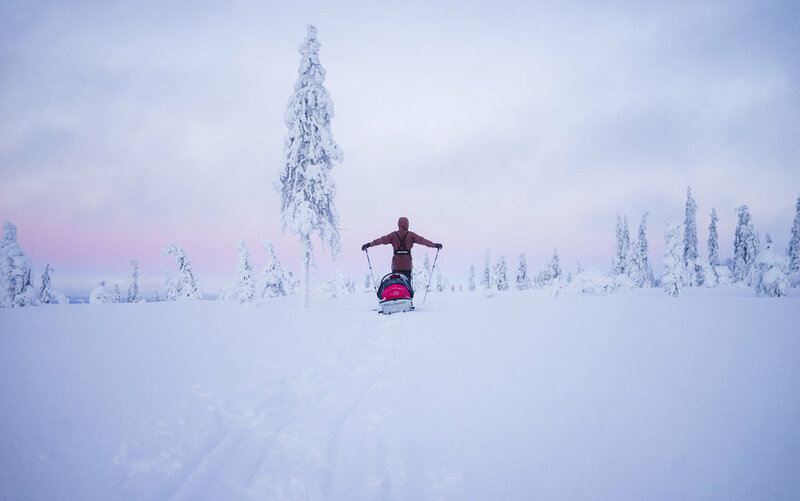 You can rent a Fjellpulken or similar sledge from most of the ski resorts in Lapland. I'm already looking forward to taking my son for a xc-skiing trip on sea ice in my hometown Kemi, as spending a day on sea ice around the islands of Bothnian Bay National Park is the best one can do on March and April. Dressing up a baby for the cold weathers is one of the things that exercised my mind a lot beforehand. However, it's turned out to be quite easy, as we have got lots winter gear for our son as a gift. That down sleeping bag, for example, is must-have if you live here. For the very cold weather, -20 celsius and more, I use it and add another cotton sleeping bag in it. I have never found my son to be cold, but I have found him sweating and waking up because it's too hot for him to sleep. Minus 10 degrees is rather mild temperature here in winter, and it's a very good temperature for outdoor activities. What? A little ski resort in the town of Muonio in west Lapland. A hotel and cabins for accommodation, for eating there are restaurants. Nearest shop for grocery, however, is 10 km away in Muonio town centre. The place is best reached by a car. When? Really – I'd go there anytime! The area consist of Finland's national landscape, has many lakes and fells, which are, as you may know, everything you need for a perfect outdoor holiday (you can never go wrong if there's clean water and differences in altitude). In summer and autumn the place has lots to offer for hikers, and in winter time there are a few slopes for alpine skiing and snowboarding, but most importantly the most beautiful landscape for xc-skiing in spruce forest. Why? Because it_is_beautiful. Any time of a year. Pallas-Yllästunturi National Park area is around.